This charming series features easy to read, realistic fiction short stories about Anna Hibiscus, an earnest and funny little girl growing up in "Africa. Amazing Africa." She lives with her parents, her extended family, and her two baby twin brothers who simply go by the names, "Double" and "Trouble." In this set of adventures, the onset of harmattan, or the dry season, means that the whole family must learn to conserve water. After carefully saving their water, they are able to keep their garden going... until big-hearted Anna realizes that there are poorer folk living in town who need the water more. In the next story, Double and Trouble more than earn their names when they dip into the candy supply, and leave Anna Hibiscus to take the blame. Finally, in preparation for her upcoming trip to visit her Canadian grandmother, Anna's well-meaning family take her shopping for "oyinbo" clothes to wear in the cold weather. Anna's mother is an oyinbo, or foreigner with white skin, and the whole family wants to make sure that Anna looks good and stays warm for her big trip abroad. 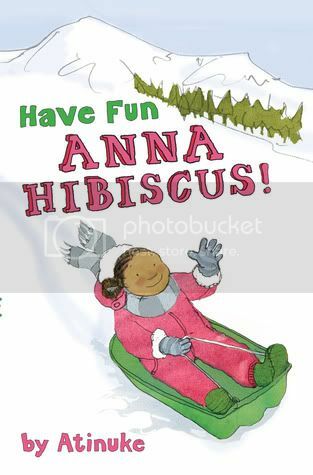 In Have Fun, Anna Hibiscus, Anna is off to Canada to visit with her white grandmother. She has never seen snow before, is frightened of Grandma Canada's pet dog, isn't sure if she'll be able to stomach foreign food, and initially doesn't get along with the other kids in town. Everything resolves happily, of course, when Anna discovers that she loves playing in snow and Grandma's dog Qimmiq is able to come to her rescue when she finds herself lodged in a snowbank. While nothing will ever replace the tasty African food she is used to, Anna Hibiscus finds traditional Canadian Christmas food delicious too, and eventually comes to befriend the neighbor kids. 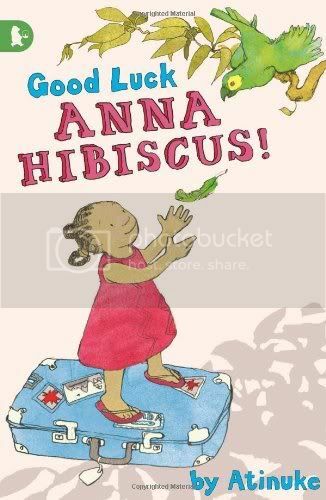 While the book never explicitly states what country Anna Hibiscus lives in, or how old she is, I have to assume that she is probably a first-grader, and writer Atinuke says she was inspired by her own childhood growing up in Nigeria. The appealing illustrations which decorate nearly every page and large type make for a comfortable read for readers new to chapter books. I will put this series into the hands of children who are hungry for stories with black characters that are not set during the Civil War, or the 1960's. Warm, relate-able, and unique, Anna Hibiscus is certain to take her rightful place beside Junie B. Jones, Clementine, Ruby Lu, Ramona and other classic early middle-grade fiction. I received free copies of these books from the publisher.